Third trip to Africa using the expertise of Jurgen @ Karoo Biking. Four weeks Jan/Feb 2018 of pure magic through South Africa, Zimbabwe, Botswana, Namibia & back into South Africa, from the wonderful boutique accommodation, to fantastic non-metal roads, joining everything up to create a faultless very memorable self-guided holiday for myself and my partner. From route planning to restaurant options, both Jurgen and Menzi were extremely helpful. The Okavango Delta, was very special thank-you. Thanks to you we had very special and unforgettable two weeks in South Africa. After one week at home this dream is still in our heads, again and again images of this wonderful trip appear in our minds. We running again from the Rhinoceros mother with its Baby, we are impressed by Flagstaff, the width and the variedly landscape, the friendly African people, the sunsets, Jurgens’s knowledge of wine and of course the lovely Cappuccino and so on and so on … The choice of the localities, guesthouses and lodges was very impressive for us and there were no wishes left. It was an all in on package and the approaches were often exciting. We pay you a compliment for the compilation/ arrangement / composition. Well done. Thanks to “our hero of the day”. In future, when we get on and off our bike we will remember South Africa, Jurgen and Karoo-Biking. Keep on going – so that many more of your guests can have the pleasure of such an adventure trip. Thank you very much for the professional prepared tour. Jurgen you did a top job working out the tour, lodges and nevertheless the excellent places for dining and wining. All of us were very impressed about the quality of this tour. Jurgen you are a perfectionist. Well done. Marchant it was such a pleasure to meet you and listen to your extreme tour stories (USA, Kanada, La Paz ++++). Very impressive but not possible for us, for a south african warrior no problem. Wish you all the best for your next idea of crossing Russia. We had a lot of fun together, thank you. You both together are an excellent team for Karoo Biking. Stay together and be successful for many years to come. I think there will be at least 1 more tour booking in some time by Michael. He is very keen going from Capetown to Windhoek. He had really to battle a bit going after the tour by GS now again on his R1150R. I can only start the season on 01.04.2015. Hopefully there will be nice weather around easter to meet the other guys. Attached a photo showing me on my bike. it was a pleasure dealing with you, thank you for everything you did during this trip. The hotels, restaurants, advise, journey program and your assistance for Philippe Babielle were perfect. The bikes were simply fantastic. If you would like a letter in French, for your web site, no problem !! and if you would like some picture from the gang , please tell me. We’ll be back next year, 12 to 13 days , Johannesburg to Victoria Falls. It is with great pleasure that I send this letter of commendation to Karoo Biking, one of BMW Motorrad’s official tourism partners. Rarely does a supplier’s business ethos dovetail with our own. Passion, innovation and excellence are hallmarks of great companies and often measurable by the repeat business they secure. In me, you have secured a customer for life. Thank you for the exemplary planning and work that went into making the seven day BMW Motorrad press tour through Namibia an unforgettable success. We got all sorted out, thanks. I can’t begin to say how amazing the trip was. Certainly a wonderful opportunity..your outfit is top notch. All of the accommodation and route planning was great. My wife loved the hotel in Wilderness..we will be back. Now onto the Two Oceans race.. Thanks again for organizing and leading an awesome West Coast motorcycle tour. My brother and I truly enjoyed every aspect of the journey. It is obvious all the hard work you have put into the business — and it shows through passion and flawless execution. I look forward to another chance to go on a Karoo Biking tour in the near future. Further I would be happy to serve as a reference for those considering this excursion of a lifetime. I want to especially thank you again for a great trip. I learned a great deal from you about the bike and the riding. One thing about biking is that you have a lot of time to reflect on your technique while you are riding. You did a fantastic job with the ride, the logistics, the lodging, the cuisine, the WINE, and general knowledge of the area. I will definitely see if I can send some US business your way (yes, you will have to suffer with the Americans if they come). Enjoy growing your business!! I look forward to seeing Karoo in all international markets in another 10 years time. Dear friends bikers, do you dream of South Africa and Namibia ? Gravels roads, desert, wild animals and so many other wonderful sites are waiting for you. Thanks to Karoo biking, which provided us with a true and efficient organisation, turning our dream into reality, during the November Tour. Don’t waste time to prepare the tour, Jurgen knows quite well all the best places, which you will enjoy to visit. The level of accomodations fulfil pretty well the needs of the most demanding bikers. It was really top of the class. Adding here and there some surprises secretely and well prepared by Jurgen. We brought back eternel memories from a group of friends, sharing the pleasure of african sun set aperitives, sun rise breakfast, and more surprising an unbelievable diner in the desert, under a wonderful starry sky. Thanks a lot to them both for the friendly spirit they have showed all along the Tour. For the future french candidates of this tour, I wanted to provide them with the here after comments from my french friends bikers, who took part of this wonderful adventure. The Garden Route Tour was the 4th organized tour my wife and I have been on and the 1st with your company.This was the best in a number of ways, the organization was the best I have seen so far – unique and 1st class accommodations and pretty much one gourmet meal after another.The Route was a terrific balance of tar and gravel roads with spectacular winding mountain passes, coastal 2 lane roads and pastoral rural towns which seemed to be from time gone by. This tour is a great introduction to South Africa as so many climate zones are visited and the roads are in such good condition. We were pleased that a low GS650 was available for my wife and my GS800 performed flawlessly, either of these bikes are excellent for this tour. This was the 1st time my wife and I rode on gravel and we found that we were up to the task, any competent road rider will be able to handle the gravel portions of this tour, and of course now we have enough experience for Namibia! The experience of the Karoo Garden Route tour, which I did in February 2010, was a real lifetime experience. Jurgen and the team delivered a perfect combination of enduro riding on gravel through rugged mountain passes, exciting high speed riding on sweeping sealed roads, unique high calibre accomodation and first rate dining. A truly unique, enjoyable and unreplicatable experience. We really enjoyed SA and we found the variations in scenery fascinating. The pictures that you took, Werner, were excellent and certainly bring out the atmosphere of the trip. Superb! As this was our third bike trip but the first time with a professional photographer I believe it works. Certainly it is also something to look forward to after the flat spot on returning home. Please keep up the good work. Jurgen, the trip itself for us did include a number of firsts the longest ever off road and the longest distance covered in one day. The accommodation and planning were all excellent and perfectly timed. Your knowledge of the trip and of the places we visited made us fell more than just tourists. The selected routes catered for all levels of biking tastes and the bike themselves were a credit to the team that looks after them. Please pass on our thanks. Even though you couldn’t have too much influence on the weather, you still did a pretty good job..! It is difficult to cater for all the different tastes and ideas that people have and I guess the more people on the trip the harder it gets. My philosophy in life is always to have a -Plan B-. I think that between us all on this trip we can up with a number of Plan B’s that in the end, did cater for everyone. After the trip and before we all went our different ways, everyone, and I mean everyone did say that they really enjoyed the trip and that is what counts. We are considering our next trip and we quite like the sound of the CPT to Joburg trip – watch this space! It was an awesome trip. I loved every moment.Bikes where great, accommodation great and the general organisation of it all was faultless. A trip like we had with a group of good mates,and with some rugby to top it off, will be hard to beat. It has been five days since we returned to the states and we are still talking about the trip. Just wanted to take a few minutes to let you know how much we appreciate all you did to help make our second visit to South Africa a wonderful trip. Just like the first time the bike was in excellent condition & performed perfectly. The accommodations were of high standards and the hosts at each location were wonderful. Each one was willing to go out of their way to insure that our stay & experience was a pleasant one. Just like our first visit, the scenery was fantastic, the roads were good & the people we meet were friendly and courteous. The fact that we had friends with us this time only enhanced the great experience. I can guarantee that we will return a third time and I would not consider working with anyone else. Many thanks to you & Donnie for all that you did. The tour was absolutely awesome. There was a great mix of scenery and conditions and the accommodation was top notch. Add to this a great bunch of fellow riders and guides and the overall experience was well above expectations. I would thoroughly recommend it. The route planning, choice of accommodation and pre-ride briefing by Karoo Biking (Juergen) was very professional. We were taken care of from the moment we arrived at Cape Town Airport until we left South Africa. 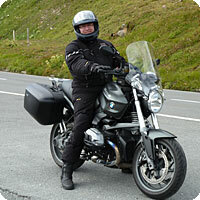 The route was scenic and interesting, the landscape varied and perfect for riding the BMW’s through a range of terrains. While most riders only enjoy the endless sunshine of South Africa while visiting this exotic location, we rode into what was termed ‘the worst storm front in 7 years with a cold snap from the Arctic’. The week before our arrival and after we departed the temperatures were perfect for riding a bike around the southern tip of the continent. We rode in rain, snow, hail and ice covered streets – definitely an experience despite the cold toes and just another reason to return and have a look at the country again in the future – with hopefully much more pleasant temperatures! Juergen, thank you for organizing a memorable trip. 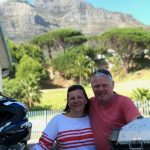 In March of 2008, we went on the Cape Town to Johannesburg tour of South Africa with Karoo Biking and found that it was one of the best tours that we have been on. Each day was a new experience. We where able to see all the different parts of the country. The lodging was beautiful and unique and we went on some safaris both in a boat and land rovers. Each picture that we took was like a post card with beautiful scenery. The guides that we had were from the area and were able to give us some history with stories of the area. Knowing the area as well they did they were able to find some really nice places to eat lunch while on the road. The food was wonderful. We never had a bad meal. The only problem we had was that the 14 days went by too fast. Jurgen, I got your text, but couldn’t reply. That’s so funny that you know Johan. I LOVED riding around Joburg, it was so much fun!!! People drive really well there, not like here in North Carolina where everyone drives so slow it’s as if they’re moving backwards, and they freak out when I lanesplit. I look forward to returning to South Africa though, and will always rent from Karoo! Thank you for a fantastic trip, I think I’ll be wearing my new South African smile for a long time to come!! This was my third guided motorcycle tour with Karoo-Biking and definitely the best of the lot. I experienced a travel package consisting of perfect organisation, breath-taking routes – adapted to all skills levels – and very unique and exclusive accommodation places. There were so many highlights in the course of this journey; Jurgen never failed to surprise us, his intricate knowledge of South Africa and Namibia, combined with awesome accommodation and fantastic culinary experiences made this a super trip. The other participants and fellow riders were just the cherry on top of the cake. We all had a splendid time. One might be the opinion, that these journeys don’t come cheap, I definitely say it was worth every penny spent. For my part, I am already planning the next tour with Karoo Biking, there are still so many places to see and roads to ride in Southern Arica. After being back in the UK for over a week now, we still can’t get the sights, sounds and smells of South Africa out of our heads. The tour exceeded our expectations in all ways. The accommodation and restaurants were obviously carefully chosen and always of high standard. The selection of locally produced food and wines each evening were something to look forward to at the end of a day’s riding. And the riding was fantastic with a good mix of tarmac and gravel roads. The R1200GS performed wonderfully two-up and on the day when Donna opted to ride in the support vehicle into Die Hel the bike brought back memories of off road riding from earlier years. Speaking of the support vehicle, our driver Brendon was great and provided a wealth of knowledge on the local flora and fauna especially on Donna’s trip into Die Hel. We had a great group of people on the tour from a variety of countries but what really made the tour special was our guide, Celia. She always had a great attitude and her local knowledge of the Klein Karoo gave us a special insight into the region. She seemed to be related to half the people in the region and knew the rest. Thanks for the great holiday and hope to see you again. ‘Karoo Biking certainly know how to organise and deliver a biking holiday experience of a lifetime in all aspects! We are looking forward to many more trips with Karoo. In fact we are already planning our next! ….’The itinerary was superb and varied – a good balance of travel, sight seeing, local culture, history and wild life, catering for my groups personal needs and tastes with impeccable attention to detail. Our route took us along quality, open, deserted roads and gravel tracks through gorges and mountain passes. We therefore had plenty of opportunity to enjoy adventurous biking with stunning views along our way. All accommodation was individual, tasteful, comfortable and hospitable, and all in beautiful settings – villages, towns, mountain game reserves and even alongside a traditional Zulu camp. Our meals, both in the guest houses and local restaurants selected for us, were of high quality only surpassed by the excellent SA wines we sampled along our journey and specially chosen by our personal tour guide who possessed detailed knowledge of the country’s wine industry. Guess what, it was the best decision we could’ve made! Jürgen’s route planning for the two of us was simply ingenious, the choice of accommodation (we MUST mention Charles and his lovely house in Prince Albert!!! ), the suggestions for scenic routes and ways to avoid the main roads – simply fantastic. Add to that the hospitality we found everywhere and the friendliness towards bikers (which you don’t always get in Europe), amazing! Finally of course the story about Dave losing his wedding ring because he was being sick with a stomach bug and lost so much weight that the ring dropped off his finger and – because it was found by a room maid and returned to the landlord – finally made its long way to be reunited with the panicking groom in Cape Town before we flew back to old Blighty. The bikes (F650 Dakars) were our first choice and we loved riding them. So much that we’re now considering swapping our Japanese bikes at home for them (once the wallets permit us to do so). Hope alls well with you. Just to say a huge thank you to Celia, you and your team for a quite unbelievable West Coast Tour in September. Some of the dust from my jacket has faded a bit but all the photos people keep sending means that memories are still strong! Im sure others on the trip have e-mailed similar thanks – we really got on so well and had a lot of fun. I can imagine that further trips between us may well happen! I think I was probably the most nervous participant initially – having only had my license for 3 years and being a woman travelling alone etc. The guys at Huijs Haarlem sorted me out though and quickly after meeting you and Celia and the others on the trip, I realised no need for nerves. Bikers are nice people! And we all continue to learn etc. I think my riding improved through the ten days – I calculated that I did more miles on the trip than I had done on a bike previously! Im still not that keen on windy mountain passes at any great speed – but there was never a problem to let others pass whilst I took in the views! It was a quite fantastic trip- some big miles for sure and the extent of gravel and off-tarmac riding took some people by surprise I know. I think having travelled in southern Africa before, I was less surprised by the distances and the condition of the roads were way better than many other countries in the region. Also, I think the fact that I had done a short course back home with BMW on off-road skills helped me. Travelling the distances, feeling the size of the country, being away from main roads and crossing into Namibia were keys to the trip for me. And then all those spring flowers through Namaqualand – quite amazing! I think we all wished we could stay longer in all the guesthouses we stopped in. The accommodation and hospitality (and the wine) were fabulous. I felt bad leaving trails of red dust in most of them! My favourite stops though were the ones along the road – taking shade wherever it was and having Wagner pull up with cold cokes. Celia seemed to have an unlimited supply of goodies in her tank bag as well! just returned to the states and wanted to thank you for the great South Africa experience. After that long flight, it was great to see Jurgen patiently waiting for me right outside customs. I did a solo trip over 3200 km through stunning coastline, arid mountains, breathtaking wine country with green valleys. I didn’t know South Africa was so beautiful! Thanks also for the effort in setting up the route and accomodation which I found diverse and comfortable. The roads, the people, the food, it couldn’t have been a better journey. Sorry for all the dirt on your brand new 650 Dakar which ran flawlessly. I wouldn’t want to take any other bike down the isolated roads of “The Hell”. Thanks again to all the fine folks at Karoo. I’ll look forward to my next trip with you. we very much enjoyed the trip that you arranged for us. The accommodations were masterfully different from each other, yet all enjoyable. The bikes ran flawlessly, and we enjoyed the scenery. You really gave us a nice combination of places to see and stay, and made the whole process as easy as it could have been. Just wanted to drop you a line to let you know that we made it back to Florida with no problems. We are back in our regular routines. I wanted to thank the two of you for your effort in making our self guided tour of South Africa a great success. We found the BMW 650 GS to be the perfect bike for us on this ride. I was also very pleased to find that the motorcycle was maintained to the highest standards and performed flawlessly on our 3000 kilometer adventure. We also wanted to say that the prearranged B&B; accommodations along with airport transportation were great. All we had to do was concentrate on the fantastic roads and marvelous scenery in your beautiful country. We could not have asked for a better place to ride or a better company to work with. I am sure that we will return to ride more in South Africa. Not only that, when our riding friends want to come to South Africa, we will be sending them to you. We had a superb holiday in SA, and everything with the bikes was excellent. Due to the SAA strikes, my colleague arrived a day later than expected and without his luggage. But, thanks to your staff’s help, who organised a jacket and helmet, we managed to head-off as planned! Warm regards and until next year! We were a little sceptical when we arrived at the airport as this was the test of the entire trip. We were relieved when we did have someone to pick us up, and Jurgen was not a con man on the internet. From then on, we were overly impressed with the whole event. Our drivers and transport were excellent, all accommodation was well above what we had expected and the tour, well, all we need is a bike, and we are happy. To sum up, we were completely impressed with the information that we received prior to the tour, the organisation of the tour, the ease of navigation of South Africa, the quality of our accommodation, the safety we felt while in the country, and the complete package of the event. Well done. all fine and back at work. Many thanx to you for a terrific break, hope to see you again in the not too distant future. thanks very much for guiding, filming, bus-driving and the fun we had together. We enjoyed our Gardenroute Tour very much! We would like to thank you for all the assistance we got especially me who was in contact with you for a very long time before the tour. You were always available even when you were on a tour, answered my mails and supplied any necessary information. Along my preparation for the tour I was sure that I made the right choice to take the motorbike tour with you and obviously it has been proved to be the right decision with no surprises. I still think about our trip a lot and everytime it brings this huge smile to my face. Thinking about all the things we’ve done and seen, and to do it with such great people. I know we are lucky to being able to do all those things. I’m definately up for another trip to the RSA! We truly enjoyed the experience and I think next time there will be more of us coming over for West Coast Tour.